Howrah Zone of SNEA/CTC held its monthly meeting on 24/02/2018 at Shibpur Telephone Building. Members spoke of severe inconveniences being faced by them due to indifferent attitude of Area Administration. Grievances poured out on acute shortage of staff and how a large number of JTOs/SDEs are looking after several charges under strain. Area Head is averse to accept logical suggestions, be it in matter of deployment of staff and/or improvement in services. Files, be it pertaining to staff amenities or material procurement for commissioning services are getting stacked up in Area Office resulting in unwanted delay for executing scheduled works. In some cases, it is observed that by the time file/s arrived to the originating unit, the rates of items increase, resulting in seeking reapproval on prevailing rates thus prolonging the process badly. Even the pressing need of materials required for GPON connections are not getting due priority. Members pointed to scarcity of modem and on delay in sending bills to draw the charge of Rs1150/- against modem installed. It has been observed, a section of customers, after using for a month or more, avoid paying the amount on one pretext or other and express willingness to surrender the service. Other demands included for posting of JTO at CSC/Domjur and SDE at Belurmath. The house decided to hold the next AGB in April 2018. Com Dilip Saha, CS, Com Sankar Sanyal Jt Secretary(E) and Com Soumen Ghosh ACS addressed the house on various development at Circle and CHQ level. The deliberation touched upon the latest position on 3rd PRC, E2/E3 IDA payscales for JTO/JAO & SDE/AO respectively, CPSE Hierarchy, pension revision, contribution towards pension fund on actual basic pay, rolling back the formation of tower company, stagnation of promotion in various cadres due to court cases etc. Meeting between Shri Manoj Sinha, Hon’ble Minister of State for Communications and All Unions and Associations of BSNL. 3rd Pay Revision. So far, the DoT has been maintaining that BSNL employees are not eligible for 3rd Pay Revision. In today’s meeting the Hon’ble Minister agreed that the issue of 3rd Pay Revision of BSNL employees would be processed and would be taken for the approval of the Cabinet. He directed Secretary to take up the matter personally with Secretary, DPE. This is a great achievement. We have broken the stalemate that prevailed in the Pay Revision issue. At the same time we have to be vigilant, till the final approval is given by the Cabinet. Formation of Subsidiary Tower Company. The AUAB representatives expressed their apprehension that in the name of formation of the Tower Company, the 66,000 mobile towers of BSNL are being snatched away from BSNL. They also pointed out that the decision of the Cabinet that, the Subsidiary Tower Company would remain under the control of BSNL Management, has been violated, through the appointment of an IAS officer as the CMD of Subsidiary Tower Company. They further pointed out that even BSNL Management was not taken in to confidence in the appointment of an IAS officer as the CMD of the Subsidiary Tower Company, which clearly shows that the Subsidiary Tower Company would not be under the control of BSNL Management. Hon Minister was non committal and the reply given by the Hon’ble Minister in this regard is not satisfactory. The AUAB has to find ways and means to ensure the rolling back of the Subsidiary Tower Company. Pension Revision. The representatives of AUAB strongly argued that pension revision should be done to the BSNL pensioners. It was pointed out that the BSNL pensioners and the Central Government pensioners are covered by the same rules. They argued that when pension revision is settled for the Central Government pensioners, the same should not be denied to the BSNL pensioners. The Hon’ble Minister assured that needful action would be taken to settle this issue and directed Secretary to take necessary action. Calculation of Pension Contribution. It was strongly argued that pension contribution in respect of BSNL employees cannot be calculated on the basis of maximum of the pay scale, when the same is calculated on the basis of actual basic pay, in the case of Central Government employeeson deputation. It was pointed out that as per the DoP&T order issued in 19.11.2009, pension contribution of the Central Government employees is being deducted on the basis of actual pay only, w.e.f 01.01.2006. The Hon’ble Minister directed the Secretary, DoT, that this issue should be settled as per Government orders. Allotment of 4G spectrum to BSNL. The AUAB representatives pointed out that it will be extremely difficult for BSNL to compete with the private operators, without providing 4G service. They strongly argued that the proposal of the BSNL Management, for the allotment of 4G spectrum by the Government, should be accepted. The Hon’ble Minister replied in the positive and assured that needful action would be taken and spectrum will be allotted to BSNL. Reduction of retirement age from 60 to 58. The AUAB representatives strongly argued that the retirement age of the BSNL employees should not be reduced from 60 to 58, as a measure for the revival of BSNL. The Hon’ble Minister told that the government is not having any proposal to reduce the retirement age from 60 to 58. Left out issues of the 2nd PRC. The AUAB representatives pointed out that this issue is lingering on very long time and needs to be settled. The Hon’ble Minister stated that this issue would be looked into by the Secretary, DoT. At the end of the meeting, the Hon’ble Minister stated that the representatives of AUAB could meet him again, as well as the Secretary, DoT, in continuation of today’s meeting. The representatives of AUAB heartily thanked the Minister for his positive response to most of the issues. THE BIGGEST EVER MARCH, BSNL WITNESSED. WE SALUTE ALL THE COMRADES PATICIPATED IN THE SNACHAR BHAVAN MARCH. WE EXPREES OUR SINCERE GRATITUDE TO ALL THE CSs, SSA SECS AND OFFICE BEARERS AT ALL LEVELS FOR TAKING ALL THE POSSIBLE STEPS TO BRING MAXIUM COMRADES FOR THE MARCH. 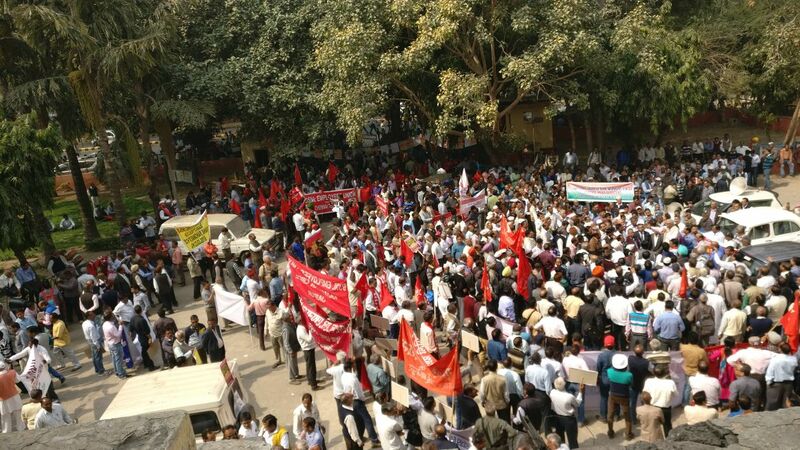 SPECIAL MENTION TO RAJ, PB, UPW, HR, MP, KRL, J&K, BR CIRCLES FOR BRINGING MAXIMUM COMRADES IN ADDITION TO THE COMRADES FROM DELHI AND CO.
As per the call of All Unions and Associations of BSNL the march stared from Eastern Court building of BSNLCO compound. 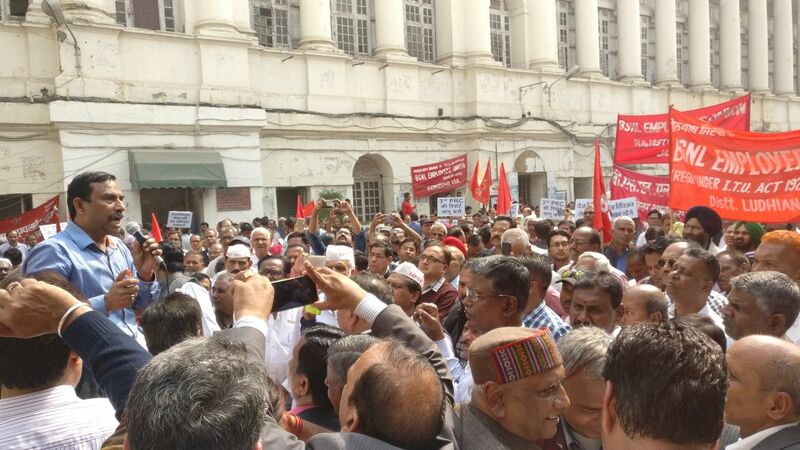 More than 5,000 comrades from nook and corner of the country to participated in the SANCHAR BHAVAN MARCH. Before the commencement of the March different Central trade unions leaders of CITU, AITUC, INTUC etc i.e. Comrade Shri Tapan Sen, Hon MP and General Secretary/CITU, Shri Vidhya Sagar Giri, Secretary/AITUC and Shri Zile Singh, President/INTUC Delhi addressed the gathering and extended the fullest support of Central Trade Unions for the struggle of BSNL employees. The March was stopped by Delhi Police at Parliament street Police Station near Sanchar Bhawan. The comrades even tried to break the barricades and march towards Sanchar Bhavan. It become very difficult for the leadership to control the comrades who forced to break the barricade and the police. Finally on the assurance of the police that they will arrange a meeting with Secretary Telecom, March culminated in a peaceful manner with a meeting which was addressed by all the GSs of all Unions and Associations. GS/SNEA, veteran leaders Com G L Jogi/Chairman and Com V A N Namboodiri addressed. About 1000 SNEA comrades from RAJ, PB, UPW, HR, MP, KRL, J&K, BR Circles participated in the March along with the comrades from Delhi and BSNLCO. The GSs of all the Unions and Associations of BSNL were escorted by the Police to Sanchar Bhawan to have the meeting with Secretary. However, Secretary directed Police to take all the leaders to meet Special Secretary(T), DoT as she was busy in preparations for the tour to Barcelona, in the evening. All the leaders took strong objection to this and categorically told that we will meet only Secretary/DoT, otherwise all the comrades will immediately reach Sanchar Bhavan, for which DoT establishment only will be responsible. SS(T) is the person putting all the hurdles on BSNL related issues and taking anti BSNL stand, we told the police to inform them. Sensing the danger, after some time, Secretary agreed to meet the leaders in the Committee room. Implementation of 3rd PRC with 15% fitment benefits: Secretary tried to justify the DoT action citing Cabinet decision and DoT is not in a position to implement it in violation of Rules. We categorically told that BSNL become loss making due to the Govt and not because of the employees and this was publically admitted by the former Telecom Minister in the Parliament. After BSNL started expanding the network, last three years BSNL recorded improvement and profit. Affordability clause is only for the Executives, not for non executives but for Non-Executives wage negotiation as per DPE guidelines not started. In the DPE guidelines, affordability clause is not there, even then DoT did not issued guidelines for wage negotiation even after repeated reminders from BSNL. This is dual stand. DoT become anti BSNL, we complained to secretary. Rollback of Tower Subsidiary: We expressed our apprehension that it will lead to disinvestment. The recent developments established that. The CMD of the Tower Subisdiary and the Board of directors were decided without the knowledge or approval of BSNL Board, how it can be possible? It is told that there will be Joint venture (JV) which will lead to disinvestment. BSNL is earning about 500 Cr this year from tower sharing which will go away. In the future BSNL mobile expansion will be under threat as the JV will demand rent for all the BTSs which will be a huge money. Secretary and others don’t have any reply. Pension revision for the Govt pensioners from BSNL: We questioned why pension revision is not happening as it is not linked with profitability or affordability of BSNL. Officers of DoT did not have anything to answer. The other issues settlement of let out issues related to 2nd PRC and No reduction in retirement age from 60 to 58 years and no VRS also briefly discussed. Secretary explained that the issues are already in her knowledge but she is not the final authority to decide, a political decision is required on 3rd PRC. Hon MOSC called a meeting tomorrow to discuss all the issues and we have to wait for the directions from the Hon MoSC. After the meeting with Secretary, all the GSs met CMD/BSNL and DIR(HR) BSNL Board and apprised about the discussions took place with Secretary/DoT and others. CMD informed that he along with Secretary will attend the meeting tomorrow with Hon MOSC. Make all out efforts to make the SANCHAR BHAVAN MARCH ON 23.02.18 a big success. DoT categorically rejected all the demands of the employees of BSNL. Even the issues like Pension Revision for the retirees who retired prior to 01.01.2017 also denied linking it with pay revision. In fact pension has to be paid by the Govt, not by BSNL. Pensioners has to seriously consider legal remedies at the earliest for the pension revision. This once again establishes the indifferent attitude of the Govt/DoT towards BSNL and its employees. We have to respond it organizationally, in every possible manner. Meeting with GM/CFA/ East held on 14/02/2018 at Salt Lake—-It was an introductory meet after assuming his charge as GM/CFA/East. A general discussion was held on service matter, business viability and constraints in human resource to run the show. GM expressed serious concern over declining business and staff constraint in operational area. Association expressed on lack of established system to consolidate business and make the brand occur. The pressure exerted by authority, indeed increase services to customers but fails to preserve long term objective. The policies framed are acting to the detriment of BSNL and mere hard work cannot be a lone substitute to turn around the company. Work in haste, sometimes makes officials vulnerable to scrutiny for not adhering to laid down rules. Every organisation has to have a system secured, functional and feasible to deliver effectively. GM expressed, the time is critical and to balance by rationalizing the system and also deliver our product in time is turning out to be challenging. He expressed on his constraint and compulsion for pulling human resource in area of acute shortage from among the existing pool and sought cooperation in this regard. Association also discussed on absentee records being asked for the strike days on 12th & 13th of Dec 2017 and on severe inconvinience faced by some executives for being posted far away from residence. He informed to consider the requests soon there is a little improvement in situation. SNEA/CTC welcomed a large and enthusiastic group of young JTOs at CTO/building who are poised to infuse huge energy in the activity of the association. This group had innumerable queries and suggestions in their mind for clarity and welfare of the organisation. There were suggestions to include some new entrants for inputs on E2/E3 payscales for JTO/JAO &SDE/AOs and other equivalent cadres, seeming observation of decline in intense of struggle with respect to E2/E3 payscales, keeping confidence in SNEA for ultimate deliverance and revealing the vested groups who are deliberately misinterpreting, inculcating confusion and derailing the process. CPSE Hierarchy is on the anvil and by virtue of consistent struggle the target of 30% superannuation benefits is closing its gap, gradually. Com Shivdhar, Com Debasis Mullick Com Hare Krishna Fouzdar, Com Anjan Bhattacharya, Com Biswajit Biswas, Com Sujoy Mahinder, Com Sanjay Yadav, Com Abhijit Biswas and others with all honesty had put forth their queries, sought clarifications, extended suggestions on issues recorded. Com Dilip Saha, CS explained in details the causes for delay in achieving our demands and how CHQ is relentlessly working to see it happen. The case of E2/E3 payscales has been deliberately sent to DoPT /DoE instead of DPE to see it gets delayed further. Inspite of negative intent of DOT, association is playing a commendable role by keeping keen watch on its progress. It ought to be kept in mind that large disparity in pay among JTO/JAO is also to be settled without further delay. Now, coming to promotion, CPSE Hierarchy is awaited for Board’s scrutiny before final approval. It has to be ensured that DOT and independent representatives in Board are thoroughly detailed by BSNL before its consideration. Many executives are awaiting promotion for last more than 18 years and any further delay in its implementation will be highly demoralizing. The target for 30% superannuation benefit is well on the course. It took a lot of time to consolidate the issue among all stake holders. Irrespective of profit/loss of the organisation, association did force its way in increasing the contribution. This apart, it would not be wise act to keep silent on 3rd PRC. Its a well known fact that BSNL, being a 100% CPSE is defined to meet social obligation at subsidized rates. It is mandatory for BSNL to serve NOFN, LWE and other non viable projects in meeting government’s objectives. The core business of BSNL is getting overlooked. The entire obligation is bound to make the organisation profitless. So, citing profitability cause to deny the benefits of 3rd PRC to BSNL employees is nothing but a mockery of interpretation and a travesty of justice. Its time to ride over petty differences and face the hostility with sheer grit and determination. It is this young force that will keep the flame of BSNL burning. In matter of local issues, there were suggestions to make quarter allotment online and enroll executives in JETCCS having permanent residence in other states. Association informed to take up the issue with the concerned platform. Association conveys its unqualified appreciation to the young and spirited members who made this congregation to happen and come out with pertinent views on various unresolved issues. It also feels proud to learn that many who could not turn up was badly engaged with office related work. This speaks of the sense of responsibility among the young members and how it enlightens an association. Com Sankar Sanyal Jt Secretary(E), Com Prasanta Ghosh Organising Secretary, Com Soumen Ghosh ACS and Com Tapan Chakraborty, President addressed the house. Forum of All Unions and Associations/Calcutta Telephones observed Satyagraha on 5th of Feb 2018 at Telephone Bhavan. AUAF/CHQ held five days of Satyagraha from 01/02/2018 to 05/02/2018 at Corporate Office. Forum of Calcutta Telephones decided to observe the first and the last day of Satyagraha at Telephone Bhavan to draw the notice of Circle Head on sheer injustice being meted out to employees of BSNL by denying the benefits of 3rd PRC, pension revision and by forming tower subsidiary company. Com Sankar Sanyal Jt Secretary(E) and Com Dilip Saha CS addressed the gathering, criticizing the decisions of DOT/management for depriving the entitled dues and forcefully taking away a large chunk of business by way of formation of tower subsidiary company.